In celebration of the event I’ve been waiting 2 years to attend, Lollapalooza, I’ve decided to be really original, and make a mixtape for each day. 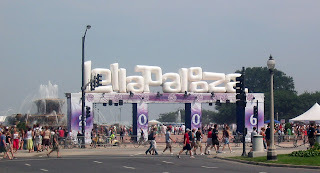 Though I can’t claim to know all of the artist descending on Grant Park next weekend, I think have done enough research to keep up. After arriving by way of Amtrack the night before, I plan to begin Lolla with Rogue Wave‘s set on the Myspace Stage. If their performance in Ann Arbor last fall is any indication, they should feel right at home with tracks like “Lake Michigan” and “Chicago X 12”. Day 1 gets complicated at 2:15 when I have to decide between the cheer-leading anthems of the Go! Team and tribal sounds of Yeasayer. From there, I’ll head for the PS3 stage, to see if the hype Duffy has received from across the pond is worthy. After that I’m inclined to see the Black Keys, before hopscotching from stage to stage to catch Million $ Mano spinning and Mates of State crooning at the same time. 6:15-8:00 is a free-for-all with The Raconteurs, Bloc Party, The Cool Kids & CSS battling. Though I still haven’t been persuaded to the ways of Radiohead, I would probably check out a few songs before enjoying the Chi-Town nightlife.